Unroll pizza dough over baking tray sprinkled with flour. 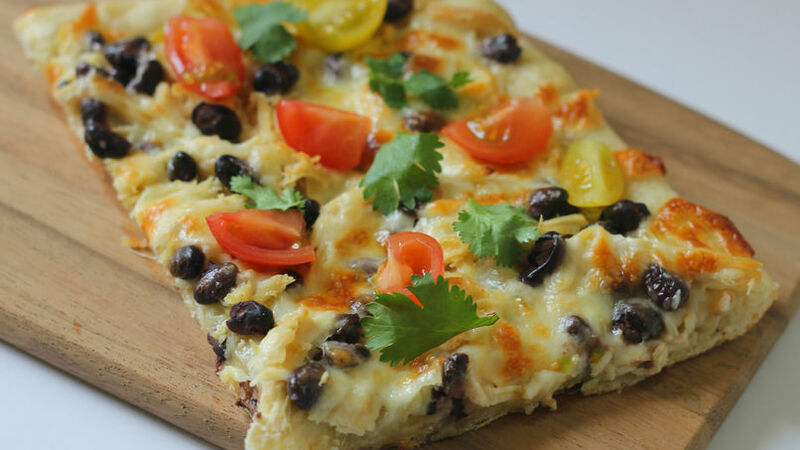 Cover with salsa verde, chicken, black beans and grated cheese. Bake pizza for 15 minutes or until the cheese is melted. Remove from oven, top with tomato wedges and cilantro. For a little bit of heat, add a touch of chile peppers. I came up with this dish purely by accident. I had leftover chicken and beans but I didn’t want the typical nacho dish. I was craving green enchiladas so I felt inspired to create this yummy dish. This pizza would probably be equally as delicious with a red sauce, but I thought the salsa verde gave it the perfect touch. Try adding different types of cheese, but remember to finish it with a good layer of queso fresco. Will you try it?